Shirts with added stretch naturally hug the body for a particularly close fit. They also provide some flexibility, giving you more movement. 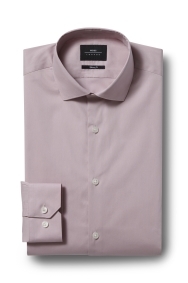 This Moss London shirt with in built stretch is cut to sit close to the body. The fit is narrow on the shoulders, chest and waist, while the cutaway collar adds sharp style. You can machine wash this shirt at 40 degrees making it an easy option for everyday wear. Wear with a textured suit in any shade – it will go with classic navy and grey as well as more unique greens and neutrals. Shirt is a bit baggy despite it being a skinny fit, the arms and chest are a bit too big, even the smaller collar sizes are still baggy, but it is a high quality material for the shirt. Items fitted fine and arrived as described. Great item, great fit great quality.